Beginning hobbyist fish keepers new to establishing a tank should read up on the mistakes of people who came before them and avoid some common pitfalls. With the availability of mini-aquarium packages, it may be appealing to go small. However, for beginners, choosing a small aquarium is courting failure. When the water volume is small, key water parameters change very quickly and leave no room for error. Even experienced aquarists are challenged by a small aquarium. Newcomers to the hobby should stay away from tanks under 20 gallons until you become experienced. The bigger the tank, the less impact a mistake will have on the fish. New aquarium owners are eager to add fish, often the same day they set up the tank. Some are lucky but many will quickly lose some, or all, of their fish. The water in a new tank needs to stabilize. Gases are dissolved in the water as well as minerals, heavy metals, and chemicals added to local water treatment facilities. The water itself can harm the fish. Aquarium water needs to be treated to neutralize harmful materials and allowed to stand for a day or so to allow dissolved gases to escape and the pH to stabilize. Then, it will be safe to introduce fish to the aquarium. 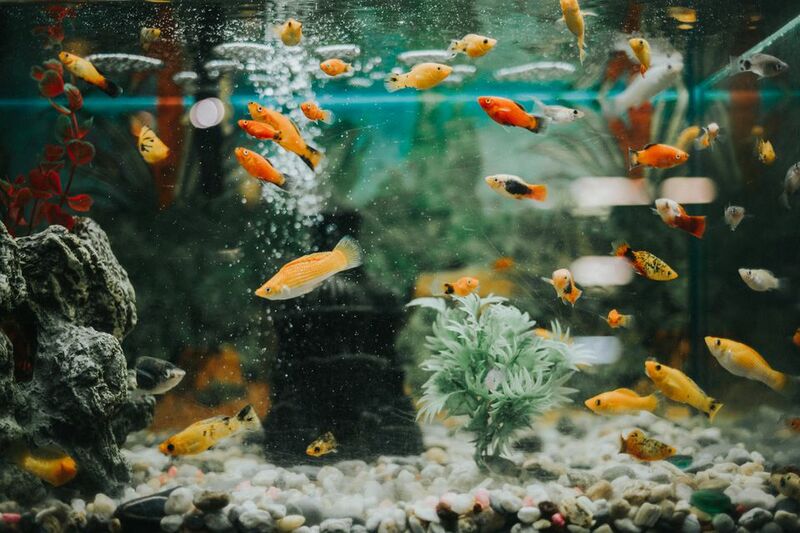 You may feel eager to fill the tank with fish, but unfortunately adding too many fish all at once is another common mistake of new owners. Until the bacterial colonies have fully established, the aquarium cannot safely support a full load of fish. In the beginning, only add a couple of small hardy fish. Wait until both the ammonia and nitrite levels have risen and then fallen to zero before adding more fish. It is very common for new owners to overstock the aquarium. Although an experienced person may successfully keep a school of 20 small fish in a ten-gallon aquarium, it would be disastrous for a beginner to attempt it. The net gallons of water should be the amount of water actually placed in the aquarium after the gravel and decorations are in it. You will want to use an 80 percent ratio. For example, say an aquarium holds 16 gallons of water after the decorations and gravel have been added. Multiply 16 by 80 percent yields a result of about 13 inches of fish as a maximum number. It is always wise to go under the maximum to rather than over. New aquarium owners often choose fish that look appealing to them without knowing their environmental needs. Some fish may fight with one another or require widely different water conditions. Always research each species before choosing tank mates. Select peaceful fish that thrive in similar water conditions. The number one mistake made by fish owners is overfeeding the fish. Fish are opportunistic and will seek food at all times. Just because they appear hungry does not mean they need to be fed all the time. Feed them no more than they completely consume in five minutes. During startup, feed fish no more than once per day; during critical times when ammonia or nitrite levels are high, withhold feeding for a day or two to reduce the wastes being produced. Fish can easily go several days without food and not suffer ill effects. An aquarium filter should filter all the water in the tank through it at least three times per hour. If it does not, it is too small. If in doubt about filter size, move to the next size up. You cannot over-filter, but you can definitely under-filter, and the results can be harmful to your fish. New owners do not magically have full knowledge of the nitrogen cycle nor do they know they need to test the water chemistry in their aquarium. As a result, they can fail to take steps to deal with harmful toxins. When the tank is first set up, allow it to run for a day or two. Before adding the fish, test the pH, hardness, ammonia, and nitrite levels for a baseline record. During the startup cycle, it is important to test the ammonia and nitrites often (see nitrogen cycle for details). Once the tank is well established, test the water monthly to be aware of unseen problems that may be brewing. If fish suddenly die, test the water to see if anything has changed. New owners are not always educated about aquarium maintenance which includes changing part of the water on a regular basis. Wastes build up in the tank that can only be removed by vacuuming the gravel and removing some water and replacing it with fresh water. Although your fish may not die if you fail at maintenance and regular water changes, they will be stressed by substandard water conditions. As a result, they will be more susceptible to disease and often will have a shorter lifespan than they should have. What Type of Fish Should I Get for My First Aquarium? Why Use Aged Water to Mantain a Healthy Comunity Aquarium?